After Magdalena, Heitor Villa-Lobos’ only other stabs at the theatrical genre were the opera Yerma (1955-56), written in New York and Paris to a Spanish text based on the 1934 play by poet-dramatist Federico García Lorca; and his final subject for the stage, the children’s fairy-tale musical A Menina das Nuvens (“The Girl from the Clouds,” 1957-58), given a paltry number of posthumous presentations in Rio and São Paulo’s Municipal Theaters. As his most ambitious and innovative vocal work yet, Yerma was an atypical oeuvre in the canon of the confirmed Brazilian nationalist. But if the operatic idiom was still an unfamiliar dialect to him, certainly the play’s tightly-knit structure (three acts with two scenes each) and dramatic plot devices (the clash of earthly frustrations with magical and supernatural elements) stirred Villa-Lobos to new heights of lyricism. The central character of Yerma is one of those incredibly demanding soprano roles requiring the vocal resources of a Leontyne Price mixed with the dramatic capabilities of Maria Callas. The story bears a striking resemblance to German composer Richard Strauss’ Die Frau ohne Schatten (“The Woman without a Shadow,” 1919) in its psychological depiction of the eternal feminine and the archetypal yearning for motherhood, albeit transplanted to rural Spain. In brief, a peasant woman named Yerma (derived from the Spanish word yermo, or “barren”) wrestles with her insatiable desire for children and the indifference of her husband Juan, who prefers working in the fields to raising a family of four. Yerma ponders an affair with the young shepherd Victor, but her honor prevents her from taking up the matter with the youth as her lover. “I myself have killed my son!” she cries at the end. Unfortunately, the opera focuses almost exclusively on the vocally exhausting title part, with the additional negative factor of “too little dramatic variety and characterization” in the remaining dramatis personae. 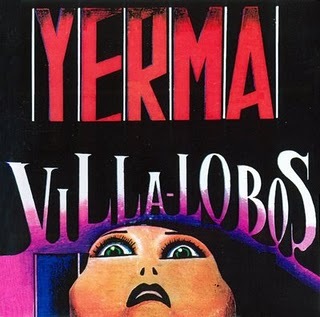 That task took him a total of thirteen years, which resulted in Yerma’s world premiere, in Santa Fe, in the Spanish language version that Villa-Lobos had initially set to music. Despite the sophisticated soundscape and numerous references to the styles of Puccini, Debussy and Arnold Schoenberg, along with “an undertone of suppressed sexuality running through the whole score,” Yerma did not catch on with audiences or with other opera houses. There have been subsequent attempts to revive the piece: the first one, in 1983, in Rio de Janeiro, which was deemed its premier presentation on Brazilian soil; and the second, in England, in July 1989. About the British production, music critic Guy Richards remarked at the time that Villa-Lobos’ orchestration, as in all his mature works, was “highly individual, full of quirks that tease the ear, but always light and airy… and never overwhelming.” Not exactly the most ringing of endorsements as far as reviews go, but a fair-minded assessment nonetheless. Could this be a Freudian interpretation of real-life events? Perhaps. But children or no, Yerma miscarried just the same, and has languished in undeserved obscurity for the better part of half a century. The same could be said for his joyous Menina das Nuvens, although this work’s performance history has lately been less checkered than that of its immediate predecessor. Dedicated to his wife Mindinha, with a text by Brazilian playwright Lúcia Benedetti, one of the founders of the Teatro Infantil (Children’s Theater) movement in Brazil, A Menina premiered in Rio on November 29, 1960, a year after Villa-Lobos’ passing. Soprano Aracy Belas Campos interpreted the title role, along with tenor Assis Pacheco, baritone Paulo Fortes, bass Guilherme Damiano, and conductor Edoardo de Guarnieri. The actual plot concerns a girl who has been brought to the clouds by a bird and is raised there from infancy into early adulthood. Upon learning of her origins the girl expresses a strong desire to get back to her terrestrial family. Complications ensue, as one might imagine, but all ends happily, as most fairy tales are wont to do, with her marriage to a handsome young prince. The critics and public remained divided in their responses to the work, which, for a children’s opera, has its longueurs. Given its creators’ reputation, they were not as receptive to The Girl’s charms as one would have expected, the main objection being its overuse of recitative (with a preponderance of “melancholy tones”) and the lack of a consistent musical viewpoint. One of its tuneful glories, we would like to point out, is the lovely ode for soprano that opens Act III, “Ó Lua redonda” (“O Moon so round”), done in the form of an “invocation to the moon”; in style and in substance, it brought to mind an earlier set-piece, the “Song to the Moon,” from the late Romantic-period opera Rusalka, written by another, better-known European nationalist, Czech composer Antonín Dvořák. You can judge for yourself how thoroughly delightful this number is — when heard in its proper theatrical context, of course — in the following YouTube excerpt from the 2009 Palácio das Artes production. 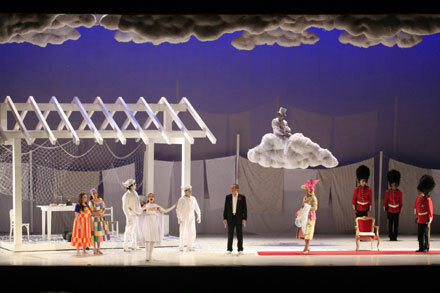 The titular “Girl from the Clouds” is exquisitely sung by Gabriella Pace, winner of the 2010 Carlos Gomes Competition; the bug-eyed Soldier in the Queen’s Guard uniform is humorously played by tenor Flávio Leite, and the Westerly Wind is voiced by bass Homero Velho: http://www.youtube.com/watch?v=Y5CJ81bkMAQ. This same production was transferred to São Paulo’s Teatro Municipal in August 2011, with most of the original cast intact. William Pereira provided the direction and scenic design, with candy-colored sets by Rosa Magalhães and subtle lighting effects by Pedro Pederneiras. The work was arranged and conducted by Roberto Duarte, whose arduous task it was to organize and put order to Villa-Lobos’ chaotic material. An amusing footnote to Villa-Lobos’ long musical career focuses on his Hollywood commission to write a music score for Metro-Goldwyn-Mayer’s 1959 film adaptation of the old W. H. Hudson potboiler, Green Mansions. 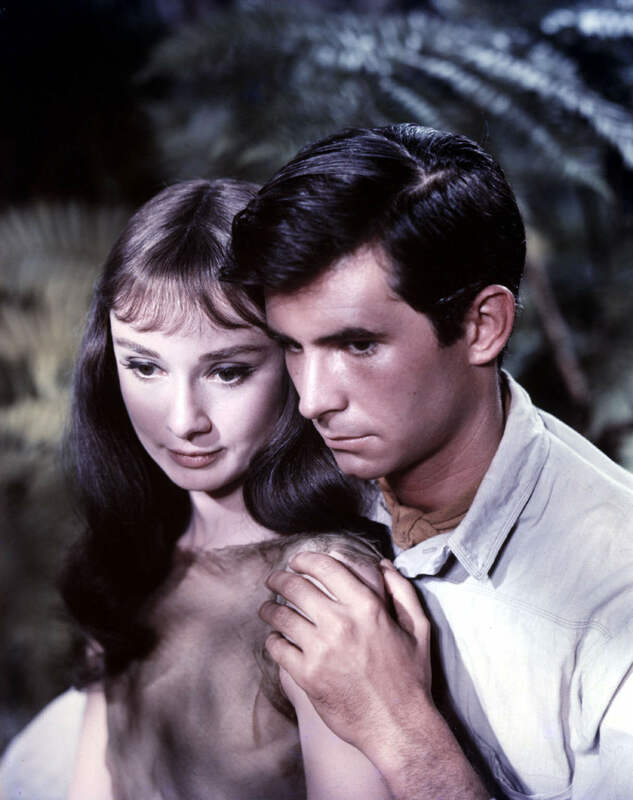 Directed by actor Mel Ferrer, the movie starred his talented wife, the delicate but miscast Audrey Hepburn (War and Peace, Breakfast at Tiffany’s), as Rima, the “bird-girl” of the Amazon, and the boyish Anthony Perkins, in his pre-Psycho period, as the blasé love-interest. The other denizens of the studio rain forest included such equally out-of-place extras as Lee J. Cobb, Sessue Hayakawa, Henry Silva, and Nehemiah Persoff. With typical motion-picture logic, the film’s producers informed the master musician of their intention not to have him orchestrate his work — actually, a standard studio practice at the time, but which totally infuriated the usually unruffled Brazilian. MGM further compounded the offense by releasing the finished product with most of the music credited to composer Bronislau Kaper, a more-established movie veteran, who had previously scored the delightful Leslie Caron vehicle Lili (1953), in addition to other gems for the silver screen. For his part, the wily Villa took his own “advantage” of Hollywood’s callous disregard for his abilities by re-fashioning the completed score into a large-scale symphonic tone poem for soprano, male chorus, and expanded orchestra. He christened it A Floresta do Amazonas, or “Forest of the Amazon,” a title that recalled, and paid belated tribute to, his earlier wanderings into the rain forest region. Four love songs written expressly for the film, but never incorporated into the final cut had their concert premieres at New Jersey’s Palisades Park on July 12, 1959. Madame Dora Vasconcelos, the former Consul-General of Brazil in New York and a voracious musical dilettante, provided the lyrics for the unused numbers. The work (along with the four additional love songs) was committed to posterity in 1959 by United Artists Records, with the difficult soprano part taken by the legendary Bidu Sayão, who came out of her early retirement as a special favor to the conductor of the recording sessions: her most esteemed friend and admirer, the gravely-ill composer. There have been several complete recordings of Forest of the Amazon, including a highly recommended 1995 version with the Moscow Radio Symphony Orchestra, conducted by Villa-Lobos expert Alfred Heller, and starring American prima donna Renée Fleming who brought Rima the bird girl to vivid life. 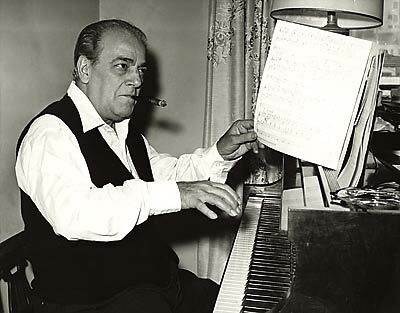 Heitor Villa-Lobos eventually succumbed to the bladder cancer that had been temporarily halted by the operation he had undergone a decade earlier. He passed away on November 17, 1959. Four months before his death, however, Villa-Lobos received the prestigious Carlos Gomes Medal as part of the festivities commemorating the fiftieth anniversary of the opening of the Teatro Municipal in Rio de Janeiro. One could make the argument that this award was a rather dubious honor, what with his having produced no operatic masterwork of any lasting renown. On the contrary, he had done more for Brazilian music education, and for Brazilian social awareness of music’s beneficial properties and potential, than any other national celebrity before or after him. Although not the prophesied savior of the Brazilian national opera, Villa-Lobos was without doubt the most famous and highly regarded native-born classical musician in memory. * The movie Green Mansions was not the composer’s first attempt at a film score, since, as we already know, Villa-Lobos had begun his long association with the cinema during the silent-movie era, as part of the music-band at the Odeon Theatre in Rio. He was later commissioned by the Vargas administration to provide the music for a patriotic picture, O Descobrimento do Brasil (“The Discovery of Brazil,” 1936-38), which was transformed by Villa into a four-movement concert suite of themes of the same name. The Great War, as it was once called, served as the dividing line between the conventions of class-conscious Europeans and the introduction of modern sociological methods into fin de siècle thought. As an example, the resultant jolt that mechanized warfare brought to bear on the lives of the populace henceforth dispelled all pre-war notions of glory and honor in battle. As previously indicated, 19th-century concepts of romanticism and morality, as they related to literature and art, were already on the wane and began to give way to more a nihilistic outlook overall. Cynicism and disillusionment grew rampant among those who survived the most catastrophic conflict Continental Europe had ever witnessed. While in literature the elevation of the poor and downtrodden to near reverence was hardly front-page news — Dickens, Hugo and Zola were a few of the outstanding authors whose novels had been preeminent before this period — it was Goya and his provocative Disasters of War etchings, Daumier with his powerful rendering of Rue Transnonain, and Géricault via his monumental The Raft of the Medusa who had previously set the tone for polemically-charged artwork. Not to be outdone, the advent of realism in opera (known as verismo), with such praiseworthy efforts as Bizet’s Carmen, Puccini’s La Bohème, Charpentier’s Louise, Massenet’s La Navarraise, Giordano’s Andrea Chénier, and d’Albert’s Tiefland, gave notice to audiences that attention must be paid to festering social issues and economic injustice (still a hot topic even today). This trend eventually brought forth new and artistically viable forms of protest, with expressionism one of the most striking. Having made its presence felt in late 19th to early 20th-century poetry and art, expressionism’s effect on music was elaborated on by German sociologist Theodor Adorno as the “literary ideal of the ‘scream.’” Every work of art, he wrote, “was thus likely to be shocking or difficult to understand. Only through its ‘corrosive unacceptability’ to the commercially-defined sensibilities of the middle class could new art hope to challenge dominant cultural assumptions” (Source: New World Encyclopedia, August 24, 2012). Dramatically speaking, we need only consider the much later Stephen Sondheim/Hugh Wheeler through-composed vehicle, Sweeney Todd, as a distant but equally perverted relative. Based on the exploits of a former soldier-turned-barber (again, the Sweeney Todd connection), the Willy Loman-like Wozzeck suffers a constant stream of mental anguish and physical abuse from his so-called betters. Unable to cope with his and his common-law wife, Marie’s impoverished status, Wozzeck lashes out impotently at his tormenters, to no effect. Right from the opening scene, the hypercritical Captain rebukes Wozzeck for having had a child out of wedlock, thus questioning his moral makeup. Wozzeck counters with a profoundly moving observation that it is difficult for “Wir arme Leut” (“We poor people”) to have morals without money. At this, the Captain nearly chokes on his own vehemence. It’s a good thing he’s a fictional character. Who knows what he would have said if he’d ever had the chance to meet up with Wozzeck’s promiscuous sister-in-arms, Lulu! Wozzeck’s signature motto, “Wir arme Leut,” is repeated by the orchestra in the penultimate scene, after Marie’s brutal murder and his self-induced drowning have taken place, in what the Saturday Review’s late critic Irving Kolodin once praised as “a dirge for the collapsed world” of the protagonists, a “tensely, proudly beautiful and expressive” last interlude before the painfully poignant finale of the couple’s now-orphaned child playing on his hobbyhorse. The themes of poverty, hopelessness and despair, spiced with a touch of the Grand Guignol, were explored in another brief work, Puccini’s one-act shocker Il Tabarro. This grimly realistic portrait of working-class Parisian life premiered as part of his Trittico (or Triptych) project at the Metropolitan Opera in December 1918, barely a month after armistice was declared. Conceptually, Il Tabarro (“The Cloak”) has much in common with Wozzeck, in that both operas feature adulterous pairs in amoral situations, wretched social conditions, and overly violent episodes and/or conclusions. Puccini did not bask in this work’s unrelievedly gloomy company for long. His final lavish opus, Turandot, debuted at Milan’s La Scala in 1926, a year and eight months before Wozzeck made its mark in Berlin. What a difference that year and eight months made! Why, to anyone’s ears there can be no question as to the sharp contrasts between these two composers’ approach to their subject: the debonair Puccini, a master melodist and experienced “man of the theater” extraordinaire; and Berg, a master of dissonance, as well as a doctor of musical expression and emotional upheaval. John Rockwell, formerly of the New York Times, described Berg as a gifted, “psychologically acute colorist” — but a “twelve-tone Puccini”? Hardly! Indeed, no other conductor has done more to turn the audaciousness of Berg’s vision for Wozzeck into a palatable “twelve-tone” staple of the opera-going experience than James Levine. Since first presiding over the Metropolitan Opera Orchestra in a 1974 revival of this fabulous masterwork, Maestro Levine has conducted all but a handful of productions (he divided his Wozzeck duties with the British-born Jeffrey Tate during the 1984-85 season). Here, Levine’s experience with this work and how it should sound in the patently huge confines of the Met Opera auditorium proved invaluable. The current revival, directed by Mark Lamos and designed by Robert Israel, premiered on February 10, 1997. “It was a dark production,” observed veteran opera writer Garry Spector, “with splashes of color [red being the most prominent] and excellent use of shadow effects.” I heard the Saturday afternoon broadcast of March 22, with a cast headed by baritone Thomas Hampson in the title role, soprano Deborah Voigt as Marie, tenor Peter Hoare as the Captain, bass Clive Bayley as the Doctor, and tenors Simon O’Neill and Russell Thomas as the Drum Major and Andres, respectively. 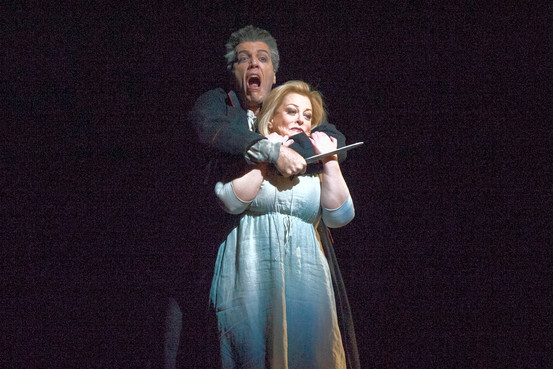 This was Hampson’s first assumption of the difficult, laser-like role at the Met. His connection to Massenet’s romanticized Werther, the previous broadcast work heard just the week before, and Berg’s harried private is intriguing, to say the least. Incredibly, Hampson has sung the rarely performed baritone version (arranged by the composer) of Werther on past occasions. Barring a few key changes and a transposed high note here and there — and given a singer of stature and charisma, which he qualifies for on all counts — it can be safely pulled off. 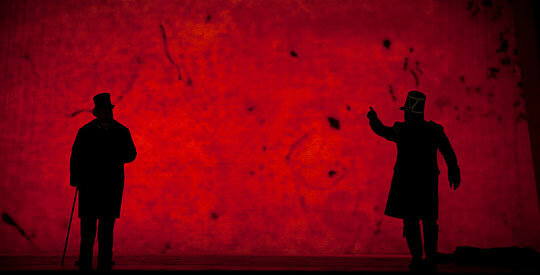 But how did Hampson do as the hallucinating “poor soldier” Wozzeck? With such illustrious Met predecessors as Hermann Uhde, Geraint Evans, José van Dam, Christian Boesch, Alan Held, and Mattias Goerne to contend with, Hampson raced through the ordeal with voice and stature intact. He brought his own particular brand of emotional commitment and sterling musicianship to the part, along with his thorough preparation and a solidly-conceived incarnation of a man slipping ever so noticeably into madness. Using his imposing height to his advantage, Hampson’s slender build is nowhere near Alan Held’s massively bulky form, bald pate and haunted visage. There’s something feral about the character, but in a childlike, non-threatening way. 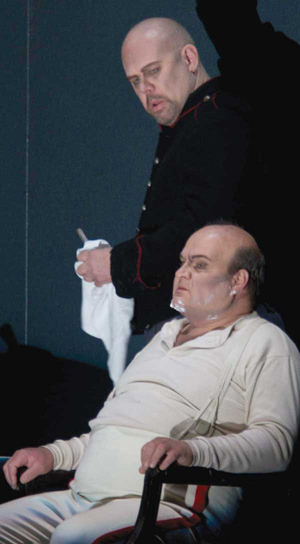 Although possessed by inner demons, the best Wozzeck interpreters are fairly adept at evoking the audience’s sympathy. While Hampson proved a bit short in that department, his peerless tones nonetheless penetrated the heavy orchestration at crucial moments. The final denouement where Wozzeck wades too deep into the lake to drown was gripping theater, thanks to Hampson’s noble efforts. Deborah Voigt’s Marie, while not as taxing as her recent Wagner and Strauss assignments, was crisply acted, as well as firmly articulated. This is a most congenial role for Deborah, whose thinned out top notes in Die Walküre and Götterdämmerung have definitely seen better days. As Marie, she etched a sympathetic portrait of the whore with a heart of gold — for her child, that is — and an uncontrollable urge to be loved by the strutting Drum Major (trumpeting tenor Simon O’Neill). The famous bible-reading passage at the start of Act III was heartbreaking in its simplicity, as delivered by Voigt. Peter Hoare’s Captain and Clive Bayley’s Doctor fit the general pattern set forth by Berg of two clueless and duplicitous souls convinced of their own infallibility, yet incapable (or unwilling) of noticing Wozzeck’s physical and psychological deterioration. The other minor characters, as brief as their assignments were, each in turn contributed to the sum of the opera’s individual parts. This is a harrowing work indeed, a disturbingly concentrated look at a sick mind trying to survive in a sick world. Wozzeck can take place at any time, and at any place (I’ve often thought of Fort Bragg as a possible spot for the action). In that, it’s a timeless masterpiece of man’s inhumanity toward his fellow man. As an ensemble piece, Wozzeck is as intricate as anything in Mozart. And to think that at one time the opera was deemed unplayable (come to think of it, so were Strauss’ Salome and Elektra). Look how far it’s come since the time of its debut. 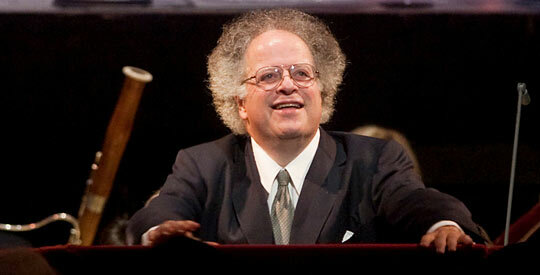 Much of the credit for the opera’s staying power at the Met can be attributed to James Levine. His championing of this once inaccessible stage piece has enriched the modern repertoire and brought richness and diversity to the Met broadcasts as well. We poor people thank you, Jimmy! After the thrilling Round of 16, World Cup Soccer fans were treated to an extended Fourth of July weekend of action-packed quarterfinal matches. I wouldn’t be giving anything away to announce that prior to the quarters all eight of the so-called favorites (as determined, I guess, by odds-makers in the know) had won their various match-ups. Not ONE of the underdog nations was able to overcome those odds. Such upstart teams as those from Chile, Uruguay, Mexico, Greece, Nigeria, Algeria (who gave the Germans the most difficulty), Switzerland and Team USA all failed in their quest to make it past heavily favored Brazil, the aforementioned Germany, the Netherlands, or Argentina — all ranked in the top five. With the exception of former world champion Spain, who sputtered out early in the tournament, that left the above four favorites to join Colombia, Costa Rica, Belgium and France in the knockout field-of-eight round. Starting with the French, Les Bleus did their best to stem the rising Teutonic tide — which wasn’t easy, what with the poised German strikers possessing a clear height advantage and near pinpoint accuracy. Blessed with the likes of Thomas Müller, Miroslav Klose, Bastian Schweinsteiger, Mezut Özil, and Mats Hummels, Germany took the lead off Hummels’ header in the 12th minute of play. 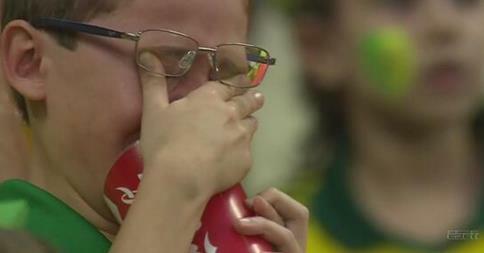 It was enough to put them into the semis against Brazil on Tuesday, July 8, in Belo Horizonte. Uh, about last Friday’s quarterfinal win against Colombia, the cost of Brazil’s 2-1 victory may have been too high for fans to bear. Team captain Thiago Silva was yellow-carded, and will miss the semifinal match with Germany, due to his pointless blocking and unnecessary roughness of Colombia’s goalie Ospina. With no adequate substitute in sight, it’s difficult to believe how his absence can be anything but bad news for the Brazilians. In another, perhaps even more “necessary” foul, goalkeeper Júlio Cesar tackled Colombian attacker Carlos Bacca in the penalty area, earning another yellow card and a penalty kick to boot. James Rodriguez, Colombia’s 22-year-old superstar, converted it into his country’s lone goal, giving his teammates hope of “possibly” conquering Brazil. Not a chance, fellas! But the most egregious display of the match involved Brazil’s own superstar striker Neymar, who was hit from behind by the knee of Colombia’s Zuñiga. 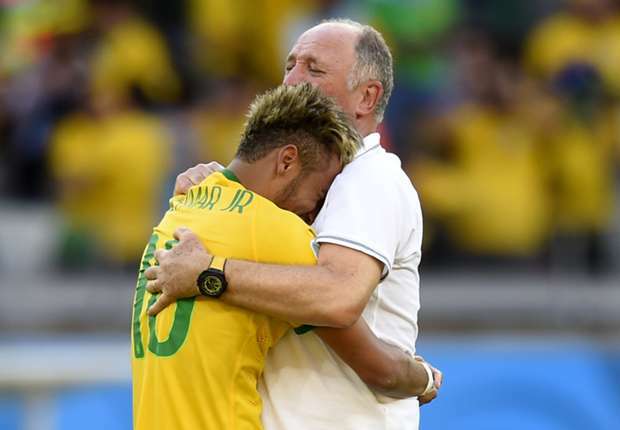 Neymar was dutifully carried off the field in a stretcher. He was later reported to have sustained a fractured rib in his struggle for possession of the ball, and will be out of action for the next six weeks. Obviously, Neymar is not expected to play in the semi as well. So where was the referee while all this was happening? And what did he do about this flagrant abuse of the rules? According to one of the ESPN commentators (I believe it was Ian Darke, my favorite sports announcer, I don’t mind telling you), the Spanish referee Carlos Velasco Carballo must have left his cards at home. During the first half of the match, not once did Carballo single out a rule infraction — and there were an indecent number of them, to be perfectly frank. All were dismissed with a wave of the ref’s hand. Is this any way to officiate, FIFA? If Sr. Carballo had started issuing yellow cards at the outset, Brazil might not have lost Neymar for the duration of the Cup; or at the very least, we might’ve been spared the spectacle of having the young talent taken off the field writhing in pain — not the most comforting sight for his followers. 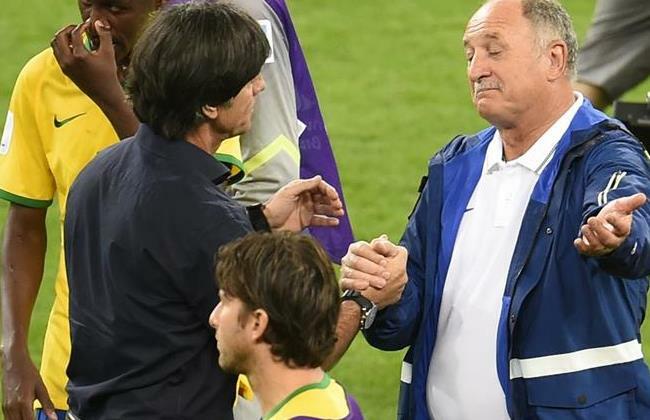 No doubt the cards are heavily stacked against Brazil in their upcoming bout with the Bully Boys of Germany. Still, I have a feeling the game’s not over until the Soccer Lady sings! And she’s going to sing a happy tune in Belo Horizonte. Why do I say this? 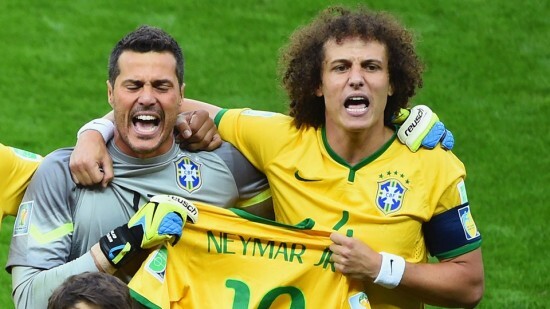 Because Brazil FINALLY started to play like the five-time World Cup champions they are. The addition of Maicon to the starting lineup gave a kick-start to the team’s offensive push. Adversity sometimes makes squads stronger. Look at Mexico against the Dutch, or Chile versus Brazil: both sides took the fight to their opponents, but good. If Mexico and Chile lost, it wasn’t for lack of trying. Each gave it their all, and they can leave this Cup with heads held high (well… most of them, anyway). The same can be said for Belgium, who fought the good fight against Argentina. Lionel Messi scrambled about in unstoppable fashion, as is his wont, thus confusing the opposition by running this way and that. Argentina’s only goal in their 1-0 battle, however, came off one of Messi’s passes, first to teammate Di Maria, and then on the rebound to Gonzalo Higuaín, who fired a half-volley shot safely into the net and beyond the reach of Belgian goalie Thibaut Courtois, who was more tortoise (accent on the “French” pronunciation in this instance) than Courtois. The final brawl of the afternoon occurred when the never-say-die Netherlands met the Cinderellas of the tournament, Costa Rica, the unlikeliest of candidates for World Cup stardom. 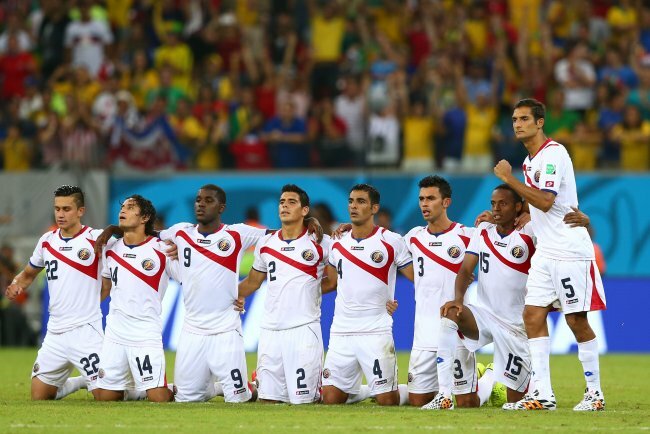 Making it to the quarterfinals on a hope and a prayer if not their fairy godmother, the guileless Los Ticos had met every challenge posed to them. But this time, they were unable to withstand the ruthless onslaught that such powerful Dutch forwards as Arjen Robben, Wesley Snejder and Robin Van Percie unleashed. It was 120+ minutes of non-stop pounding of Costa Rica’s goalie, the heroic Keylor Navas, who was able to shut down the Flying Dutchmen until the dreaded penalty shootout. It was here that Holland’s coach, Louis van Gaal (a dead-ringer for William Shatner of Star Trek fame, but with a broken nose) and his bench of assistants (Dutch Mad Men in gray-flannel business suits and orange ties) took a gamble and came up with their game-winning strategy: to substitute the goalie of the match, Jasper Cillessen, for the fresher arms and legs of the gigantic Tim Krul. Physically smaller in comparison, Navas did his best to block the Netherland’s penalty kicks, but his best wasn’t enough to turn the tide. Krul stopped two of the Costa Rican’s tepid shots on goal, thereby giving the Dutch Masters a semifinal berth against the Argentines. Which brings me to my closing argument. There are now four teams left standing in the Cup, two more matches to go before the final confrontation: Brazil vs. Germany, and Netherlands vs. Argentina, both to take place next Tuesday at 3 o’clock PM (our time). I wish all these squads the very best of luck — they’ll need it! And may the best team win. However, a word of caution: may they win by honest means. By that, I mean let fate have a hand in their victory, not in their face. Well, dear readers, that moment came to pass. Earlier in the Netherlands vs. Costa Rica encounter, the “Hand of God” struck Navas across the eyes and forehead. To put it bluntly, it was more the eleventh-hour Dutch substitute Huntelaar’s outstretched arm that blatantly tried to interfere with Navas’ goal-tending skills. 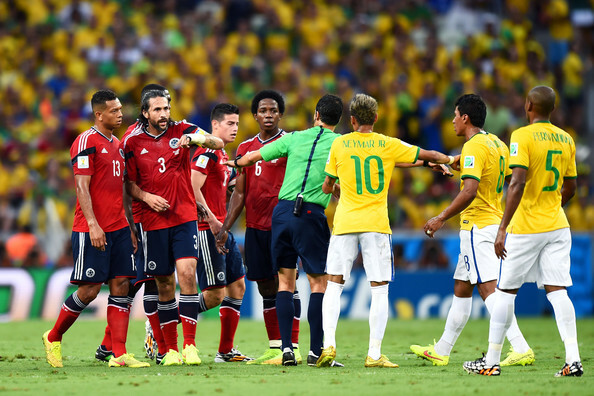 Down went Navas, and out came the referee’s yellow card — which, in my opinion, and after the still earlier roughness of Colombia’s goalie by Brazil, as well as Brazil’s own roughing up of an opposing player, was the perfect time for a RED card. Not this time, folks, thanks to another of those card-free referees. I fear that sentiment by the Costa Rican coach Jorge Luis Pinto may have overruled tactics in keeping Navas on as goalie. Although a substitute was waiting in the wings, Pinto’s heart took the place of his head in making his fateful decision. Frankly, I can’t blame him; better to have tried and lost than never to have tried at all. To replace Navas as this late stage would have crushed Los Ticos’ fighting spirit. It was a heart-breaker. Oh, man, was it a heart-breaker! Down to the last 10 minutes of extra time after scoreless regulation play, the fired up Team USA bombarded Belgium’s six-foot-six-inch goalkeeper Thibaut Courtois with shot after shot, all to no avail. After being down two goals to nothing, the U.S.’s German-born coach, Jürgen Klinsmann, decided to put in a 19-year-old substitute named Julian Green, who within a fraction of active field-time placed a tremendous volley into the farthest right-hand corner of the net, giving Team USA a needed shot in the arm. Yay! Go team, go! USA goalie Tim Howard, who suffers from Tourette’s syndrome but is one of the top five best gatekeepers in the business, must have been twitching about and jerking a blue streak throughout the offensive. 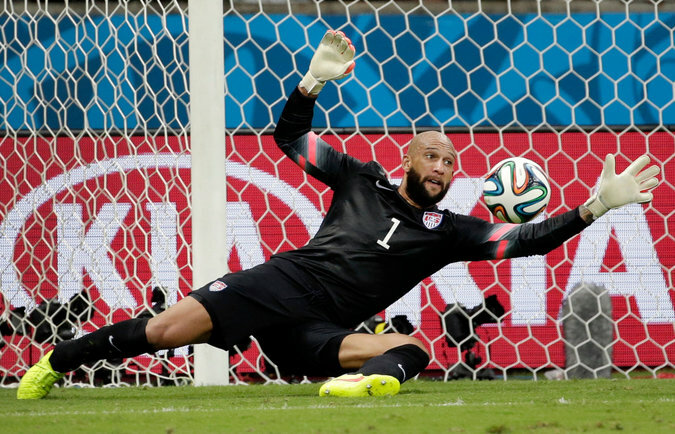 It had no effect on his superb goalkeeping skills, though, with Howard setting a World Cup record of 16 saves. But in a harrowing repeat of their 2010 performance in the Round of 16 at South Africa, whereby the U.S. lost a grueling 2-1 battle against Ghana, the Belgians belittled the American side by the same 2-1 margin in Tuesday’s match-up. Green’s goal came too little, too late for the totally spent USA squad to triumph over adversity. The heat and humidity sapped whatever strength Clint Dempsey, Michael Bradley, DaMarcus Beasley and their fellow World Cup underdogs Chile, Mexico, Greece, Uruguay, Nigeria, Algeria and Switzerland had stored up in order to press on. You can’t blame the beastly weather on poor playing and even poorer officiating. Unforeseen injuries (the early loss of USA left winger Jozy Altidore due to a hamstring pull) and dubious penalty calls (or the lack of same) were other unnatural disasters that seemed to thwart these countries’ best efforts. Beginning with the June 28 thriller between Brazil and Chile, it was frustrating to see the Chileans’ go down in infamy via penalty kicks after they miraculously made up a one-goal deficit in the 32nd minute at Belo Horizonte. The game dragged on to the inevitable shootout, with Brazil besting Chile three penalties to two, thus boosting Brazil’s chances in the quarterfinals against Colombia and sinking Chile’s chances for a first-ever bench. The Colombians had a field day, too, so to speak, against the wary but ungainly Uruguayans. Without their star striker Luis Suárez, who was banned from Cup participation for his vampirish shoulder-biting episode against Italy’s Giorgio Chiellini in a previous match, Uruguay mostly fired blanks at the Colombian goal. Colombia and their own star performer James Rodriguez will meet Brazil and 22-year-old superstar Neymar (I wonder what color his hair will be this time) later today in Fortaleza. Will the hot weather continue to be a mitigating factor, or will Brazil shape up in time to change naysayers’ mind about Neymar’s potential? 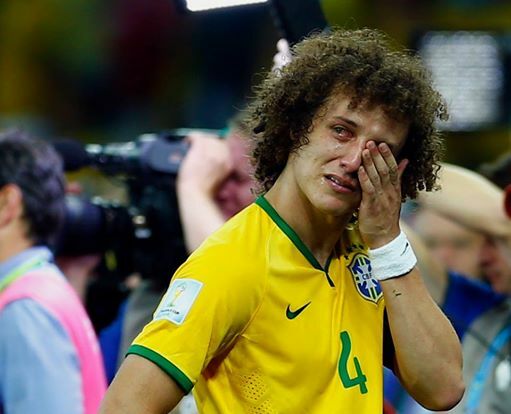 Meanwhile, it’s been publicized that many of Brazil’s players have been undergoing psychological evaluation and/or treatment, if not makeshift sessions with their shrinks, due to the enormous pressure (i.e., post-traumatic soccer disorder) exerted on them by the Brazilian press as well as over-anxious politicians — among them Brazil’s president, Dilma Rousseff, whose reelection bid comes up later this year. If Brazil makes a strong showing of their soccer skills all should go well at the polls, or so the prevailing wisdom goes. But if the national team loses or makes a pitiable meal out of the remaining matches, all bets are off as to whether Dilma — and the country per se — can recover from the shock of a loss to a supposedly “lesser” opponent. It would be 1950 all over again, when the upstart Uruguayans beat Brazil 2-1 before 200,000 awed fans. Mark my words: Colombia is no pushover. Neither are any of the other combatants in this year’s World Cup. It’s amazing that Brazil has made it this far, no thanks to the under-performing, one-man task force Hulk and the continuously problematic Marcelo. Fred and Dani Alves have been less than stellar in their initial appearances, the tall and lanky striker Jo was out-headed by a much smaller Chilean defender, and their goalie Julio Cesar needs to step up his game BIG TIME if he’s to withstand the coming onslaught. Other matches in the days ahead include the anything-goes Netherlands, with their chief diving expert Arjen Robben leading the Orange pack against the rising Costa Ricans and their hero goalie Keylor Navas; a replay of World War I with a revitalized France vying for a chance at victory against the bully boys from Germany; and don’t-cry-for-me Argentina and their goal-scoring lethal weapon Lionel Messi playing the puffed up Belgians. This 2014 tournament and the Round of 16 is shaping up to be one of the all-time most thrilling World Cups in recent memory. 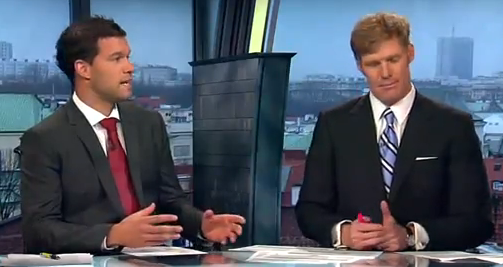 And now a word or two about the latest novelties to hit the World Cup Soccer pitch. To paraphrase the philosopher Descartes, soccer exists, therefore it is. And in order to understand how soccer is played one must first attempt to play it. The same goes for most sporting events, including (and especially) baseball, American football, rugby, basketball, hockey, tennis, cricket, you name it. But unlike the above-named activities, soccer (and by that, I mean World Cup Soccer) is one game that has the easiest to follow rules. Most of the trouble starts when folks get confused over the offside rule. If you’ve ever played the game, you’ll be able to pick this one up fairly easily. If not, just follow the bouncing ball: to put it in as simple a term as possible, there must be at least ONE defender (besides the goalie, of course) in between an attacker. If the attacker gets possession of the ball BEFORE there’s a defender, the attacker is declared to be offside. Many people would like FIFA to dispense with the offside rule. Maybe, maybe not — but for purists (such as myself), that would be anathema. However, I am all for listening to the arguments pro and con. If it were eliminated, that might reduce the game to 90 minutes of free-for-all penalty shots or interminable kicks on goal. That’s just one scenario, but I’m sure there are plenty more out there. I’m very much for advanced technology, to include instant replays on questionable calls by referees and other face-saving devices. Of course, the instant replay proposal has to be used with discretion. Otherwise, we might as well call the Cup an International Super Bowl with the inherent stop-and-go non-action taking precedent. I loved the new goal technology, however, which can correctly predict whether the ball has in fact crossed the goal bar or not. But that low-tech, foamy lather shaving cream (vanishing spray?) 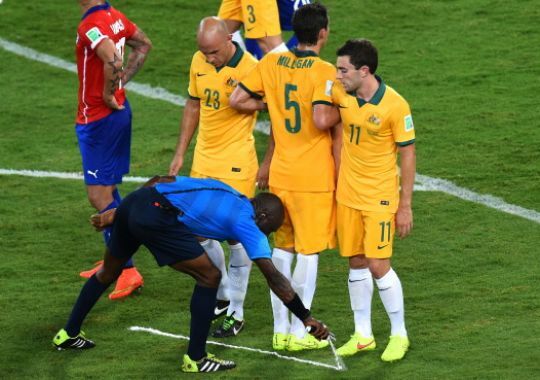 the refs have been using to keep jittery players “in line” during free kicks is a joke! Is that the best that FIFA can do? Still, if it works… why argue with success?